Last month, Dr. Alex Abramovich premiered his first documentary “Nowhere To Go: A Brokered Dialogue” at The 519, an LGTBQ2S community space in downtown Toronto. The documentary provides a glimpse into the reality of LGBTQ2S youth homelessness and the mental health challenges faced by this population. The acronym “LGBTQ2S” is used to refer collectively to lesbian, gay, bisexual, transgender, queer, questioning, and 2-Spirit identifying youth. The documentary screening coincided with the launch of The 519’s new education curriculum: Fostering an Inclusive Shelter Environment for LGBTQ2S Youth, developed in collaboration with Dr. Alex Abramovich and A Way Home. The curriculum proposes a number of ways that shelters can be more safe and inclusive for LGBTQ2S youth. Today’s Infographic Wednesday blog post will focus on a few of the key points from the 10 infographics available on The 519’s website. If you’d like to learn more, you can access the full collection of infographics here. There are approximately 150,000 young people experiencing homelessness in Canada. Of that, between 25-40% identify as part of the LGBTQ2S community. In contrast, only approximately 5-10% of the general population identifies as LGBTQ2S. 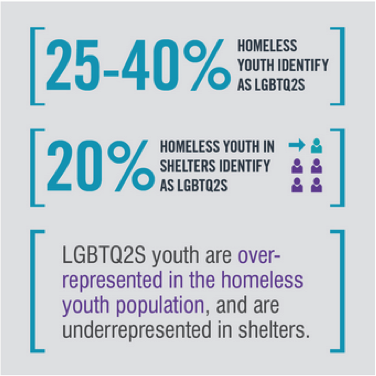 Additionally, Leaving Home: A National Study on Youth Homelessness in Canada found that 29.5% of youth identified as LGBTQ2S. The study was conducted in 2015 by The Canadian Observatory on Homelessness (COH), working with the National Learning Community on Youth Homelessness and A Way Home. Stay tuned for the release later this fall. In Toronto, although LGBTQ2S youth are overrepresented in the homeless youth population, they are underrepresented in shelters. Youth report having difficulty finding shelters where they feel safe and respected, and they are often subject to discrimination and violence. Abramovich’s 2011-2014 study in Toronto found that widespread discrimination is rarely acknowledged or addressed by the shelter system. Discriminatory practises of homophobia, biphobia and transphobia are normalized in the shelter system, largely due to a lack of training and knowledge among shelter staff. The absence of LGBTQ2S cultural competency makes it difficult for staff to intervene and stop incidents of homophobia, biphobia and transphobia. Furthermore, institutional rules and policies in shelters can contribute to the erasure and invisibility of LGBTQ2S youth. For example, standard intake forms providing only “male” and “female” gender options end up erasing many identities. This means that these youth are not included in key reports and shelter statistics, but also, youth may be deterred from accessing a shelter if they do not see their gender identity being represented or acknowledged during the intake process. Although the study took place in Toronto, many of the findings and recommendations are relevant to organizations and housing programs serving youth across Canada. Cultural homophobia (also known as ‘heterosexism’) refers to societal norms that advantage heterosexuality over all other forms of gender expression and sexual orientation. Intake processes need to ensure that young people see themselves reflected in the forms and questions that are asked. When you allow young people to self-identify, instead of asking them to fit themselves into predetermined categories, it can help them feel like they belong at the point of entry. In co-ed shelters, youth are often either assigned to a male or female floor. All gender washrooms should be implemented in shelters, and if possible, private and semi-private rooms should be an option for youth who express concern about the preservation of their safety or dignity. The 519 also emphasises the importance of prevention planning, such as strategies for early intervention, awareness raising, and programs for children, youth and families. In the U.S. specialized, longer-term housing options have been hugely successful, and housing programs for LGBTQ2S youth in Canada should be considered. LGBTQ2S specific shelters are also an option, the first of which to open in Toronto was the YMCA Sprott House in February of this year. The city has also received funding for a second LGBTQ2S shelter, set to open in 2017. As a result of the advocacy efforts, this year the City of Toronto officially launched updated shelter standards for the first time in twelve years, and LGBTQ2S cultural competency training was made mandatory for shelter staff for the first time. Toronto now requires shelter providers to ask all clients about their gender identity rather than assume and to support the choices of trans clients to gain access to sleeping areas in the gender that the client identifies. For more information, visit the Education and Training section of The 519 website. A Way Home Canada partner, The National Learning Community on Youth Homelessness, launched its online LGBTQ2S Toolkit in May 2016. You can access the online toolkit here.